By: Ellliott Wallace on July 16, 2013. All you fans of Pacific Rim, Neon Genesis Evagelion and Patlabor (Or Real Steel or District 9, the list goes on), your disturbed dreams have finally come to life. Meet the Powered Jacket MK3. 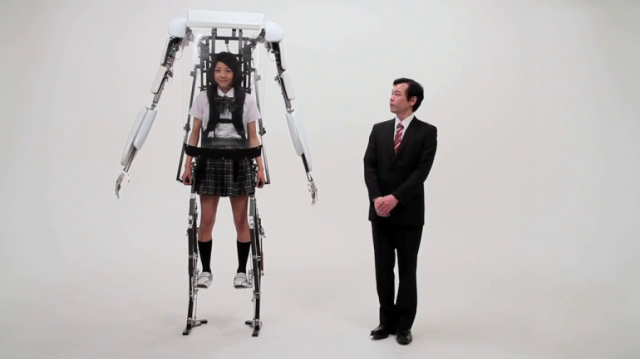 Sagawa Electronics has introduced the Powered Jacket MK3, a new robot exoskeleton. It’s only 55 pounds and has a maximum height of seven-and-a-half feet tall. it’s also easy to activate. Just strap yourself in, and move your limbs as you would normally, Power Rangers. The company has also released a funny and yet mildly confusing video to promote the MK3. According to the narrator, Scarface Santaro (Kickass name, right? Wait until you see his face…), the exoskeleton has been put through rigorous tests for its walking and running functions, making sure its capable of traversing urban areas, among other places. The robot is nimble enough to hold an egg without breaking it and can cook fish. With its large canopy windshield, this machine is ripe for every occasion, whether it’s a relaxing suburban walk or a fight to the death. You can grab one for yourself for the low price of $123,000 or 12.5 million Yen. Checking out the company’s website, there’s also Powered Jacket comic and it’s pretty weird too. Still, without translation, we can’t verify the film to be a legit product. Supposedly, this thing will be on display at Wonderful Festival 2013 in Tokyo at the end of July, so we’d just have to wait and see. But on the actual topics of exoskeletons, these machines aren’t as science fiction as they once were. However, most of these are available for specifically military purposes. So is this exoskeleton that’s going to go mainstream? Will the handicapped be empowered at last? But most importantly, where do we plug in our iPhones? Last updated by Ellliott Wallace at July 16, 2013 .